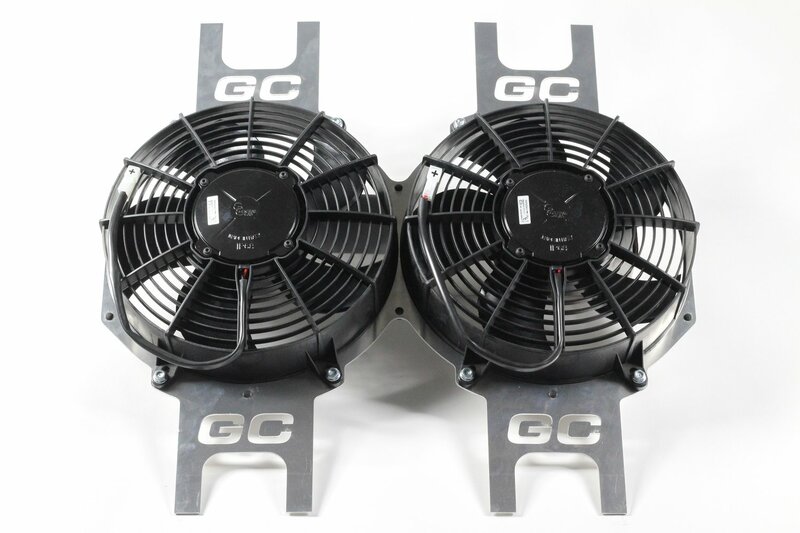 The GC Cooling Dual Fan Package measures 24" x 23" x 3.75". Featuring two 11" HP pullers cranking out 1192.98 CFM each. Designed and manufactured by GC Cooling this package is ready to mount, wire and cool your performance vehicle. The laser cut brackets are made from 1/4" aluminum and are ready to be cut and mounted. This kit comes with (2) 12" HP Puller fans,(2) connection wires, (8) 1/4x20 bolts and lock nuts, (7) rubber mounting feet. OPTIONAL (2) fan wiring kits with 40Amp fuses and 185 degree temp sensor. Trim to fit brackets allow for an easy fit. Simply measure your radiator height, trim to fit, drill bracket holes and attach using self taping screws to the radiator exterior trim.